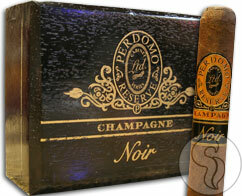 Buy Perdomo 10th Reserve Anniversary Noir cigars online! The Perdomo Reserve Champagne Noir is blended with dark, oily triple-fermented Cuban-seed Maduro wrappers meticulously aged in bourbon barrels. Filled with hints of chocolate and dark roasted coffee, this medium to full-bodied blend offers a sweet aroma with a smooth satisfying finish. This cigar is truly a MUST for all Maduro lovers.